The statute is defined as the will or order of legislature, which is expressed in the form of text. The traditional way to interpret or construe a statute is to understand the intention of the legislature. The intention of the legislature could incorporate the actual meaning and the object. The process of interpretation and construction assist the judiciary body in determining the meaning and purpose of the legislature. Interpretation helps in determining the real meaning and intention of the legislature. On the other hand, construction is used to ascertain the legal effect of the legal text. The two terms are used interchangeably, but there exists a fine line of difference between interpretation and construction in their connotations. So, check out this article in which we’ve simplified it for you. Meaning Interpretation implies the identification of true sense of the statute. Construction means drawing inferences about the subject, that are above the direct expression of text. Used when Court complies with simple meaning of the legal text. Legal text exhibits ambiguous meaning and the court has to decide whether the words used in the legal text covers the case or not. The term ‘interpretation of the statute’, means an understanding of the law. It is the process adopted by the courts to determine the meaning of legislature, by way of legislative form. It is used to ascertain the actual connotation of the act or document along with the intention of the legislature. It tends to clarify the meaning of those terms and writings which are difficult to understand. The process of enactment of the law and its interpretation takes place at different points of time and performed by two different government bodies. The interpretation of an act creates an understanding between these two and bridges the gap. It aims at finding out the intention of the author, i.e. the court needs to identify, what the author means by the words he/she has used in the text, that helps in getting what is written in the document. In short, interpretations object to ascertain the intention of the statute by the words used. In law, ‘construction’ means the process of legal exposition which determines the sense and explanation of abstruse terms, writings etc. in the statute and draws a conclusion on the basis of logical reasoning, with respect to the subject that lies above the direct expression of the legal text. The basic principle of construction of a statute is to read it in a literal manner, meaning that by elucidating the words used in the statute, ordinarily and grammatically, if it results in ambiguity and is likely to convey another meaning then the court can opt for its literal meaning. However, if no such absurdity is possible, the fundamental rules of interpretation can be adopted. 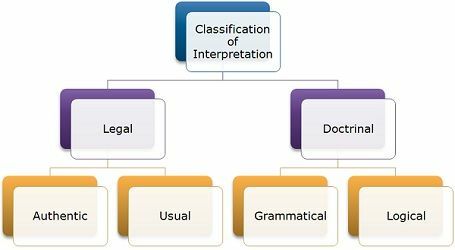 In law, interpretation refers to, understanding the words and true sense in the provisions of the statute. On the other hand, construction is described as drawing conclusions, in relation to the case, that lie beyond the outright expression of the legal text. While interpretation is all about the linguistic meaning of the legal text, Construction determines the legal effect of the words and writings of the statute. When the simple meaning of the legal text is to be drawn, then that will be called an interpretation. Conversely, when the literal meaning of the words used in the legal text results in ambiguity, then construction is opted, so as to decide whether the case is covered by it or not. When it comes to the legal exposition of the statute, act or any agreement, interpretation precedes construction. While the interpretation of the statute, is all about exploring the written text, whereas construction is used in the broader sense, i.e. it not only helps in determining the sense and explanation of the provisions of the act but also elucidates its legal effect. Thanks for using graphics to explain legal concepts! I am an attorney whose undergraduate degree is in architecture and I have been amazed and annoyed by the persistent refusal of the profession to use graphics to enhance and explain their arguments. Most even shy away from bullet points and prefer instead long and unreadable sentences. So, thanks again.